When it comes to writing a history of Hollywood or even this Blog, and think of the great stars of this or any other era, there is no star shines more brightly than this one. Still adored by fans the world over and unbelievably an icon even now to a generation of picturegoers born long after she left us, Marilyn Monroe raises the bar in terms of film stardom to a level that virtually no other even comes close. Her history is well known and documented. Born Norma Jean Mortensen or Baker in 1926 she grew up in Los Angeles. Her mother was committed to State Mental Institutions as had been her grandparents. She attended school at Los Angeles Orphans Home Society and on leaving school she worked in the Lockheed Factory. There she was discovered by a photographer looking for a subject and this led to her modelling full time. Her pictures became known on a world scale and she was signed up by 20th Century Fox with her name changed to Marilyin Monroe. Marilyn was coached in acting and continued but she did not prosper at Fox and she moved to Columbia where she had little more luck in terms of breaking into films. One of the films she is not particularly well remembered for was Don’t Bother to Knock 1952 starring alongside Richard Widmark. This was very much a straight role with Marilyn playing a beautiful but psychotic young lady who is babysitting a young child and whilst doing so becomes involved with Richard Widmark. The child wakes up and it was at this stage that the babysitter reveals homicidal tendencies.She has just, we find, been released from an asylum. 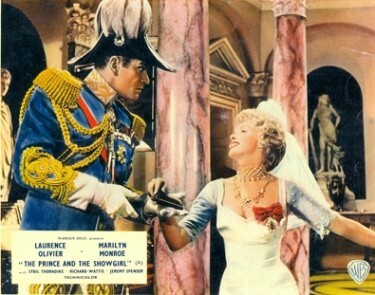 An unusual role for Marilyn – her first major dramatic part. A few largely forgettable films followed and then came the titles we all know Gentleman Prefer Blondes and How to Marry a Millionaire working alongside Betty Grable, Lauren Bacall and Jane Russell. She toured Korea to entertain US troops out there and returned to films like Theres No Business Like Show Business and on to The Seven Year Itch. One fascinating little snippet comes from Richard Todd’ s autobiography In Camera when he describes being in Hollywood to film A Man Called Peter about the life of Peter Marshall the famous preacher and it was whilst filming one of the many sermons in the film that Marilyn Monroe came quietly in from a nearby film set to watch and was seen crying as she listened to the words. She came to England in 1956 to star opposite Sir Laurence Olivier in The Prince and the Showgirl but this was not a happy film to make for her. Olivier was not at all pleased with what he perceived as her lack of discipline on the set and her lateness but I have always thought that his feelings were tinged with a certain amount of jealousy. He was, as we all know, a great stage actor no doubt but he didn’t possess the same screen prescence as Marilyn (or even his former wife Vivian Leigh) and was not a film star in the same mould as they were. 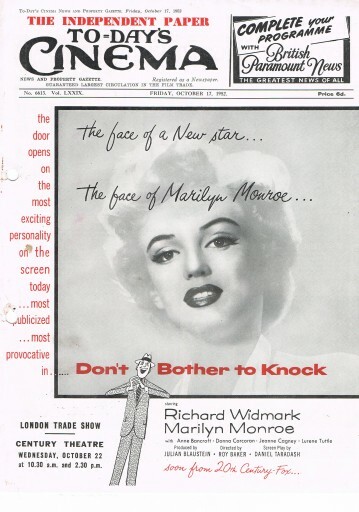 In this film Marilyn’s performance was quite light and Olivier’s a more stagey effort. I do remember that at the time this film was being made, the local vicar’s son in the village where we lived was away at boarding school and he told us that a number of the pupils in his class had worked as extras on this film. Wish I had asked more about it at the time !! Marilyn was at the time married to Arthur Miller and I often wonder what he made of it all. She made Some Like it Hot which is such a well remembered film. The film ran over budget in the making but eventually grossed $14,000,000 dollars and earned Mayilyn some $3 million. The Misfits opposite Clark Gable was to be her last real role. Her death has been examined and re-examined over the years. The recorded verdict was ‘probable suicide’. On a cruise holiday two years ago, we had a series of lectures by a former Los Angeles Crime Dept Official who had been asked to look again at the evidence they had regarding her death and this he had done in the mid 1980s. He showed us a photograph of all the documents that were left which had been kept under lock and key in his department. There weren’t that many remaining. Some of the facts he stated – firstlyover the night that Marilyn died there had been a lot of phone calls from Peter Lawford – Kennedy’s Brother In Law – to Marilyn’s home and there were reports from a number of locals that a helicopter had taken off somewhere close to Lawford’s house that night. There was also a report from near neighbours in the quiet little road where she lived that a vehicle had driven past on the morning of her death. The witness thought they recognised someone in the car but this was largely hearsay and conjecture with nothing more specific. He concluded that it was now impossible to say conclusively what had happened but that he himself didn’ think that her death was suicide.